This variety was named after Ron Evans who wrote Handbook of Cultivated Sedums and came up with the idea of starting the Sedum Society. For a bit of history about this variety, read about it in Sedum Cultivated Stonecrops by Ray Stephenson. 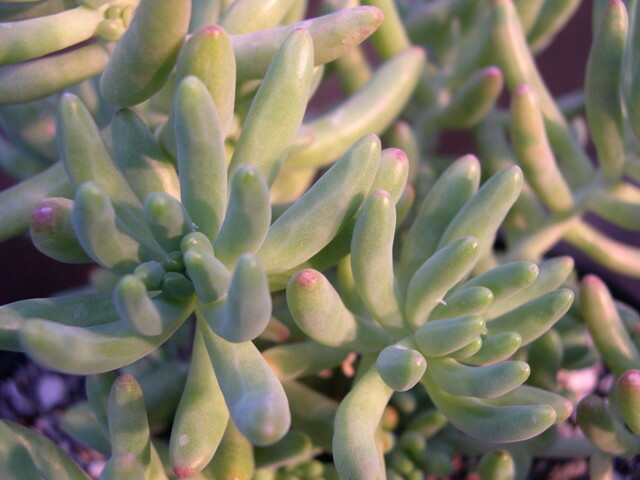 It is very similar to Sedum pachyphyllum in appearance with longer, bluer leaves that, for the most part, lack the red coloration on the leaf tips. Long clusters of yellow flowers are rare.